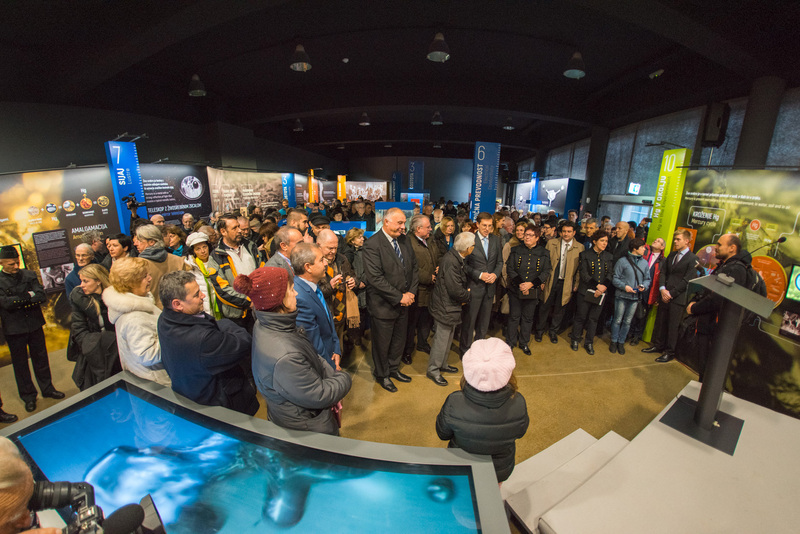 Atmosphere was festive in the town of Idrija last week – the town witnessed inauguration of a restored monument of technical heritage under UNESCO protection, and opening of an exhibition titled ”From Ore to Mercury Drops”. The new visitors centre was too small to welcome the crowd that gathered to see the town’s latest acquisition. The opening event featured opening address delivered by the Acting Director and Project Manager Tatjana Dizdarevič who underlined the importance of conserving Idrija’s heritage, notably heritage of mercury, and outlined the achievements of the restoration project in the past two years. She concluded her speech by pointing out that the restored smelting plant was a monument dedicated to each and every miner and smelter who had ever worked in the Idrija mercury mine. Bojan Sever, Mayor of Idrija emphasised the importance of Idrija’s heritage and the role of collaboration and networking with other mining towns in Europe and around the world, such as Almadén in Spain and Abbadia San Salvatore in Italy. Indeed, the mayors and delegations from these towns attended the inauguration event. Martina Peljhan, geologist from the Idrija Mercury Heritage Management Centre and lead author of the exhibition outlined the main exhibition themes and thanked over 80 individuals for help in putting on the exhibition. The keynote speaker, Prime Minister Miro Cerar pointed out that the citizens of Idrija and Slovenians should be proud of the rich heritage of mercury mining, and complimented those responsible for heritage conservation on tireless work and commitment to the goal of conserving the past for future generations. ‘’The Government of the Republic of Slovenia acknowledges the importance of cultural heritage and will fully support the efforts made for its conservation in the future’’, Cerar said. The Prime Minister added that he had spent an exciting day in the town of Idrija and had seen a number of examples of successful partnerships between local community actors. ‘’I would like to see more of such cooperation at the national level as well’’, he added. The event featured performances by the Idrija Brass Band and local accordion player Marko Hatlak. This important event brought together a number of other high-level officials, including Minister of Culture Anton Peršak, Ambassador of the Kingdom of Spain H.E. José Luis de la Peña, State Secretary at the Ministry of Culture Damjana Pečnik, a number of high-level representatives from the economy and other walks of life. The smelting plant will open its doors to visitors on February 1, and will house an interactive exhibition on the development of smelting and mercury mining industry in Idrija, including a set of workshops and experiments on mercury intended for primary and secondary school students. Restoration of the smelting plant as the first phase of an extensive project and erection of the new visitors centre, which was launched in the end of 2015 by the Idrija Mercury Heritage Management Centre, was completed in the end of January. The bulk of the funds for this EUR 2,332,810 project were provided by the EEA Financial Mechanism, while the rest of the funding was set aside by the Idrija Mercury Heritage Management Centre. The restored smelting plant also houses a permanent exhibition dubbed ‘’From Ore to Mercury Drops’’. They both tell the story of ore dug out in Anthony’s shaft, and make an important contribution to the tourist offer of the site, which is listed as the UNESCO World Heritage Site. The IDRIJA SMELTING PLANT project (Idrija – Smelting plant area of Idrija mercury mine – First phase of reconstruction) has received EUR 2 million in grant from the EEA Financial Mechanism 2009-2014. Programme Operator for the EEA Financial Mechanism Programme 2009-2014 is the Government Office for Development and European Cohesion Policy. Slovenia is eligible to a total of EUR 8,812,500 under the above Programme which covers three programme areas, i.e. Biodiversity and Ecosystem Services, Conservation and Revitalisation of Cultural and Natural Heritage and Environmental Monitoring and Integrated Planning and Control.